Golf is one of those sports that only the truly dedicated to it really understand. To the rest of us, it’s all a bit of a mystery until the Ryder Cup comes around and it becomes a national cause for some good old fashioned British spirit. Even for those who don’t have a handicap to boast of, however, the beauty of some of the UK’s most prized courses cannot be denied, and for anyone visiting Salcombe the nearby golf courses are hard to beat. Here is a selection of the best golf courses near Salcombe, Devon. Take for example Thurlestone Golf Club. Just 6.7 miles from Salcombe, the course runs along the coast at Bigbury Bay, encompassing a mix of links and cliff-top terrain. The views are frankly unbeatable, taking in Thurlestone Rock on one side and Burgh Island on the other. It offers an enticing challenge to golfers of all abilities, and if you would like a little insight into all 18 holes before you head over, then take a look at the online guide provided by their pro and PGA Head Professional, Steve White. Close to Kingsbridge, the 18-hole golf course overlooks the coastline at Bigbury on Sea as well as Dartmoor, setting a picture-perfect backdrop for your round of golf, not to mention providing some exciting challenges as well. Well protected in parts from the sea breeze by good bunkering and mature trees, it is known for offering something for both low and high handicappers, and the friendly clubhouse is an enjoyable environment for some well-deserved refreshments at the end of the day. No prizes for guessing where this one is. It is literally minutes from the historic town of Dartmouth, which, if you haven’t visited, is well worth a wander when you have a spare afternoon. Part of the area’s Best Western hotel, it has a lot to offer by way of facilities, but naturally, we are concerned with the golf. There are two golf courses on site – the 7,200 yard, par 72 Championship Course and the 9-hole Dartmouth Course. The former has hosted the West Region PGA Championships no less than six times and has been designed with a challenge in mind. Meanwhile, the Dartmouth Course offers a more relaxing day but retains the high standards that the Championship Course is known for. On the southern slopes of Dartmoor, Wrangaton Golf Club has been part of the landscape since 1895 and is split between nine moorland holes and nine parkland holes. Needless to say, the views are spectacular combining the Devon countryside with a tantalising glimpse of the sea in the distance. The moorland holes have no trees or bunkers, but there are a fair few winding streams to contend with and you may see the odd sheep or pony grazing by the winding streams. Meanwhile, the parkland nine is a total contrast, bordered by hedgerows and trees with a few bunkers to keep you on your toes. 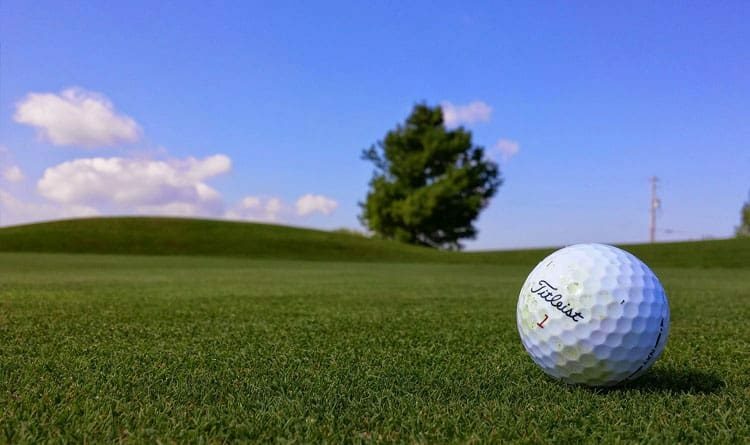 The following golfing holiday homes in Salcombe are perfect for an autumnal golfing break, not only because of the quality but because of the size and convenient parking. Book your stay in Watch Hill and tee off your golfing holiday in style. This luxury accommodation is only five minutes from the high street in Salcombe, making it an ideal base for your activity-packed break. 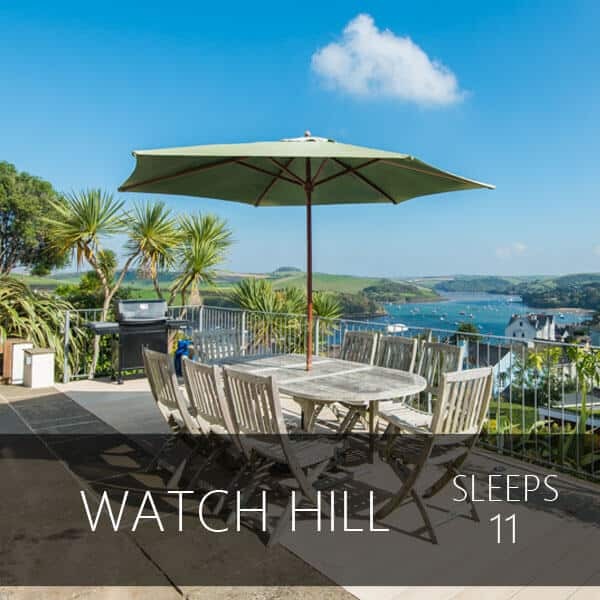 Although Watch Hill is known for its prime location and captivating views, this holiday home has been designed to cater to your every need, with spacious interiors and flexible sleeping arrangements. Perfect for group holidays, Watch Hill offers parking spaces for 3 cars as well as a large utility area for drying off wet golfing kit at the end of the day. A sunny outdoor dining area complete with a BBQ makes for the perfect place to unwind after a long day on the green. Broad Downs Barn teams traditional with extravagant to offer guests both luxury and practicality in the same property. 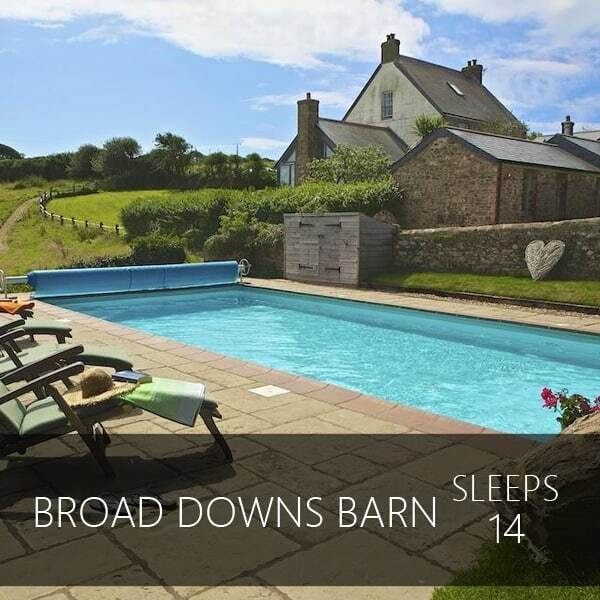 With 6 bedrooms sleeping 14 in total, this holiday home is unsurprisingly sought after by large groups with big plans. If that’s you; rest assured that Broad Downs Barn offers parking for up to 3 vehicles with additional on-site parking for a boat or trailer, so you don’t have to worry about cramming all your equipment into one car. Steeped in acres of gorgeous countryside, this property certainly hits the sweet spot in terms of surroundings, but that’s just the beginning. The barn is serviced by the latest ‘Green’ technology and enjoys shared use of a delightful outdoor heated swimming pool if weather permits. However, as the colder months approach, Broad Downs Barn becomes a spacious yet cosy retreat. With such expansive and exciting golf courses to explore during your holiday, it seems only right for your accommodation to enhance the experience even more. Make yourself at home in Cable Cottage, a luxurious holiday home sitting on the water’s edge of North Sands beach. Due to its phenomenal position, this property enjoys incredible views and proximity to the centre of Salcombe. That means that you’ll never be far away from the action, but you’ll also have a place to truly relax. Cable Cottage is ideal for families or groups of friends, with 4 spacious bedrooms sleeping 9 – not to mention an en-suite bathroom each and a downstairs wet room. Don’t feel forced to pack light: this property has parking space for 3 cars and comes with a utility area for your golfing equipment. Vine House is commonly reserved by groups of golfers seeking a taste of luxury, a place to feel at home and a space to store the kit. It’s no surprise as to why – this renovated Georgian waterhouse offers exceptional gardens, large indoor lounging areas and a utility area perfect for packing away equipment. Not only does Vine House provide space for up to 10 in the form of 5 beautifully decorated, spacious bedrooms; it also comes with 5 parking spaces, allowing you to be flexible with your transport. Should you need more room, you can choose to reserve the Sail Loft and the Boat House for additional guests. 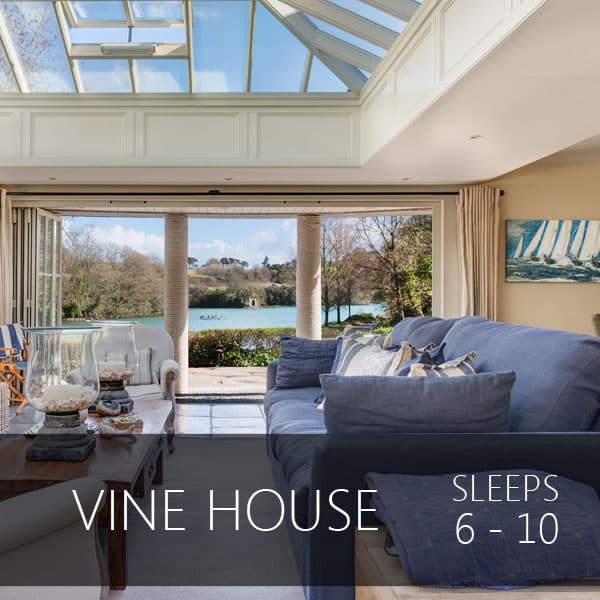 While Vine House is popular in the summer months for its sunny outdoor dining area, the expansive entertainment area combined with underfloor heating make for the perfect, warm night in during the months of autumn.